The ORB lists Sgt J W Brown (2210108) posted to 550 Sqdn from No. 1 L.F.S. w.e.f. 13.08.44 with the Dodds crew. A number of the operations undertaken by the crew also list J W Brown. But P/O A R Brown (182555) is the airman killed on 14 October 1944 (below). Letters from Arthur Reginald Brown, and showing both services number, confirm they are one and the same and that the initials "J W" seem likely to have been an error in the ORB. The service number change is normal when moving from non-commissioned to commissioned officer. See also the crew listing below. Lancaster PD319/BQ-G was flown by F/O Dodds and crew when it when it was lost on the 14/15 October 1944 taking part in Operation Hurricane against Duisburg. This was one of two 550 Lancasters lost that night, the other being Lancaster NG133 flown by the F/O Abrams crew (see Duisburg/NG133). 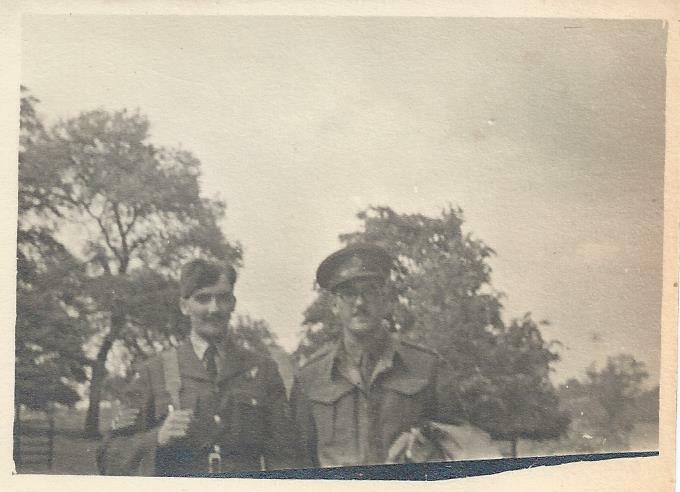 F/O Black (A/B) and F/O White were both F/O Tapsell crew regulars and F/Sgt Beckingham (W/Op) was another crew-man who was not in the original crew that transferred in to 550 Sqdn with F/O Dodds. But F/Sgt Beckingham was a regular and was only replaced by F/S Horlor on 3 of the crew's 11 operations). On that fateful night the following is known (information from Norval Black (son of F/O Black (B/A)): "The story I got from my mother is that on 14 October, Moran, the navigator, was sick and Ken White was drafted in to replace him, and as navs and bomb aimers worked closely, and as they were best pals, my father went with him. The sickness story is almost certainly true, for the Squadron records have Moran being posted out on 14 October to No.3 Base NE (non-effective), which I have come across before, and was probably a hospital facility." The entry on the 550 Squadron Roll of Honour here. 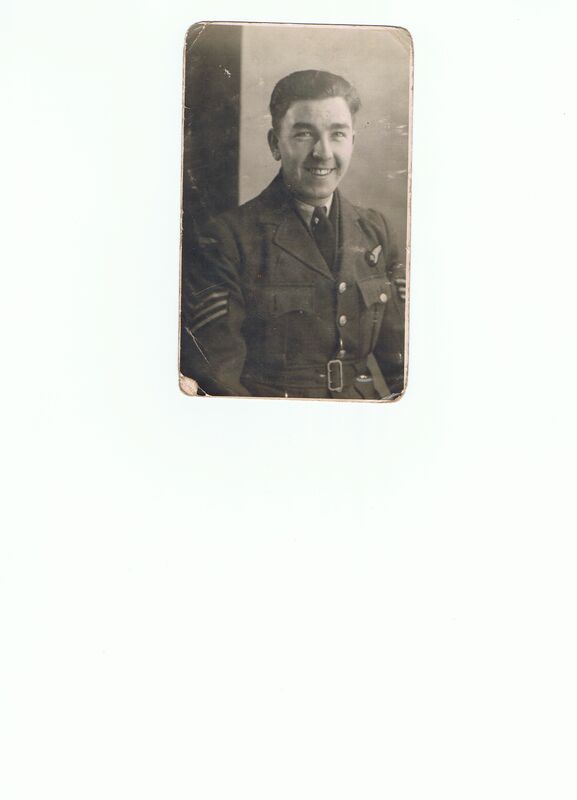 Sgt Albert Laidlaw flew as a gunner with 550 Squadron. 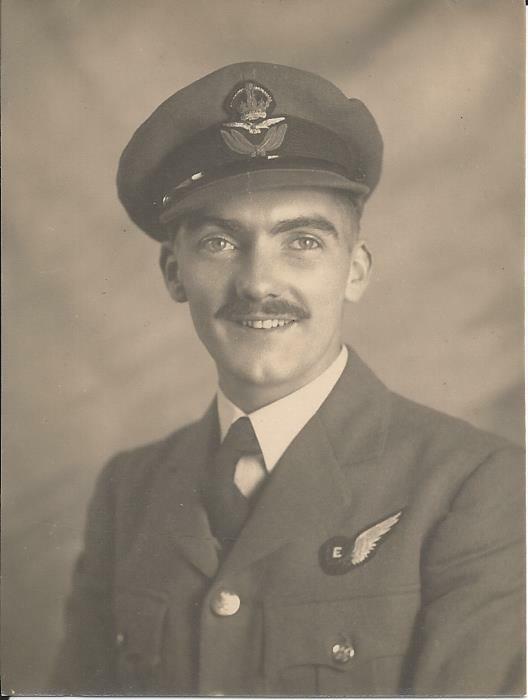 Sgt Laidlaw, along with the rest of the crew, was killed on 14 October 1944 when PD319 was shot down. The pictures labelled "D Flight" are a little bit of a puzzle. 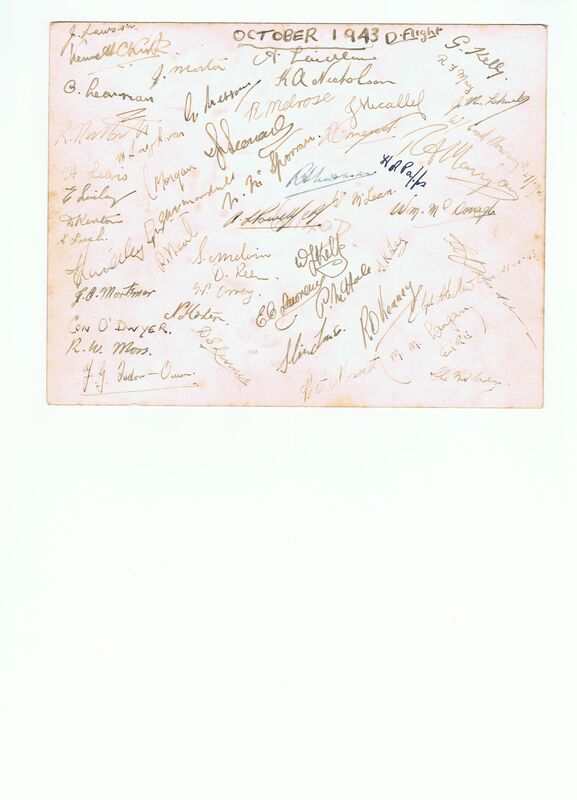 The picture showing the signatures is clearly labeled October 1943 D Flight". Indeed one or two signatures are individually dated at what looks like 21/10/1943. The reason for the puzzle: on the 550 Squadron history page (http://www.550squadronassociation.org.uk/original-site-archive/index.htm) is noted that the squadron was formed out of 100 Sqdn "C Flight" in November 1943 and originally started with two flights, growing later to three (Flights A, B and C). "In October of 1943, 100 Squadron produced an 'offspring' when 'C' Flight was formed into 550 Squadron to be based at North Killingholme. 550 Squadron was to inherit EE139 HW-R ROGER the 'Phantom of the Ruhr', which went on to complete over 100 missions." So perhaps the picture is of 100 Sqdn "C Flight" expanding rapidly immediately prior to 550 Squadron formation and they were simply adopting the next available letter, and that within a month things had moved on to 550 Squadron proper. Where the photograph was taken is unclear, but the white flashes on the caps indicate "aircrew in training" and so the photographs may well have been taken in Canada. To see a list of the last few operations the F/O Dodds crew, including Sgt Laidlaw, took part in click here (document courtesy of Peter Miller). Photos of Sgt, later Pilot Officer, Brown kindly made available by Stephen Roke. 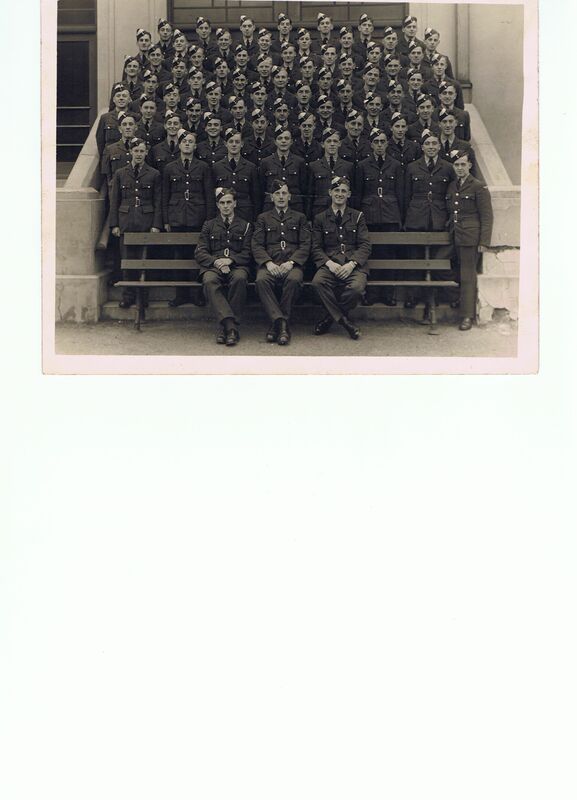 Photo annotated on the rear "Reg"
As noted earlier the ORB lists Sgt J W Brown (2210108) posted to 550 Sqdn from No. 1 L.F.S. w.e.f. 13.08.44 with the Dodds crew. But P/O A R Brown (182555) is the airman killed on 14 Oct 1944. Letters from Arthur Reginald Brown, and showing both services number, confirm they are one and the same and that the initials "J W" seem likely to have been an error in the ORB. Also shown below is his service record showing, among other things, his transfer date to North Killingholme (which agress with that for "J W Brown" in the ORB) and the dates of his commission. At the Remembrance Sunday services in November 2012 a fragment of PD319 finally returned to North Killingholme, after 68 years. Norval Black, son of F/O Henry Black (B/A), presented a fragment of the aircraft, found in Germany, for display in the Squadron Museum in North Killingholme. Information from two sources has been received in relation to the loss of PD319. In the course of research for the book Bomber Command Operation Hurricane (see below) Marc Hall recovered fragments of the aircraft including the panel of PD319 returned to the son of Henry Black as reported above. Jörg Helbig reports: "PD319 received a direct hit from flak and crashed at Duisburg (08.48 hrs (local) in the August-Thyssen Strasse at Wehofen, Duisburg) and the crew were laid to rest at the Jewish Cemetery of Holten next to those whose died from Lancaster LL909 (12 Squadron). The graves were exhumed by the Americans and the bodies transported to Holland. LL909 was shot down at the same time 8.48 hrs (also by flak) and crashed at the Mattlerbusch in the Wehofer Strasse." Thanks to Marc Hall and Jörg Helbig for information provided. A book is to be published in May 2013 on Operation Hurricane. The crews that failed to come home will be one of the key items addressed in the book. See: Bomber Command Operation Hurricane.